Accessories: Accompanied by original guarantee dated 22 May 1974, sales receipt from Bucherer, product literature, fitted inner box, and outer box. Additionally accompanied by extra links. Literature: A similar example of a stainless steel reference 6263 "Paul Newman Panda" is illustrated in Ultimate Rolex Daytona by Pucci Papaleo, pages 348 and 349. Consigned by the original owner and accompanied by all its original paperwork, including the guarantee certificate and sales receipt from Bucherer in Lucerne, this piece exemplifies why the Oyster “Paul Newman” has become one of the world’s most highly sought after timepieces. Its rarity can only be matched by its good looks and complete nature – sure to pass the test of even the most assiduous collector. The present reference 6263 features a “Panda” MK 2 dial. Paul Newman dials that feature a white dial with black subdials are referred to as “Panda” as they mimic the color scheme of the face of the much-beloved bear. These Paul Newman "Pandas" generally feature four subtly different dial configurations in accordance to the serial number, the MK2 being a version with beautifully sharp serifs on all the letters. The dial excels in all aspects: the perfect golden beige lume plots match the luminous material of the handset and the Art Deco numerals within the subdials are printed boldly against subtle, sublime concentric circles. One of the most intriguing aspects of the extremely collectible Daytonas fitted with an exotic dial are the unusual Art Deco numerals located within the subdials. The Art Deco movement reached its heyday in the 1930s but has been stylistically pervasive through to the present day. Iconic Art Deco logos that have persisted include that of Harper’s Bazaar and Yves Saint Laurent’s monogram. Geometric, stark lines that are the hallmark of the Art Deco style are thought to have been inspired by two cultural movements of the early twentieth century – Egyptomania, the world’s fascination with Ancient Egypt, and the dawn of the Machine Age, inspiring more futuristic and industrial designs. 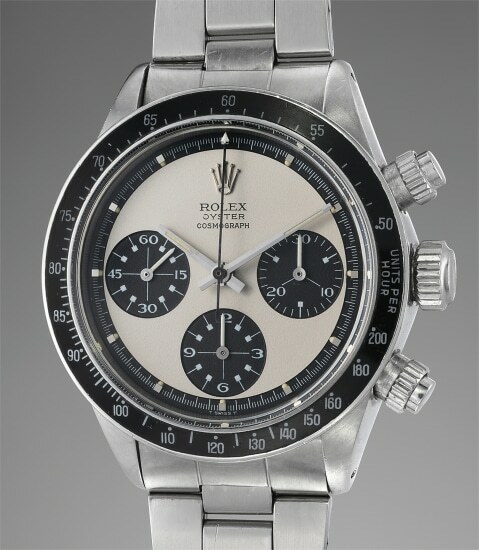 It is no wonder that as an attempt to commercialize and boost sales of the manually wound Daytona, Rolex chose to incorporate such a striking and futuristic design element.